I have been a lifelong letter writer, journal keeper, planner girl, doodler, notebook aficionado, stationery hoarder, paper enthusiast, stamp collector, slightly postcard obsessed, and in love with office supplies. You get the idea. I love it all! 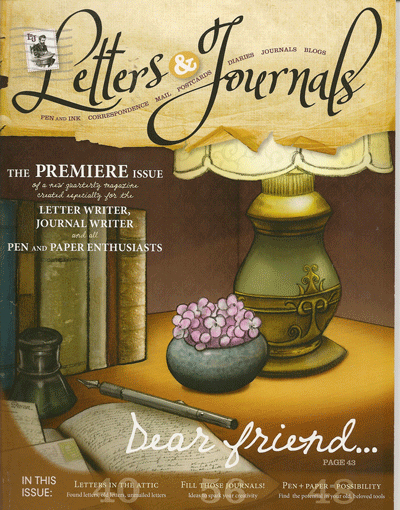 The idea for Letters & Journals came to me in 2004 while I was completing my master’s thesis on The History of Letter Writing. I remember thinking how much I would LOVE a magazine that catered to people, like me, who were enraptured with letter writing and all kinds of paper paraphernalia. Next, I began to imagine what it might look like – the articles, advertisers, images, tagline, etc. I was enthralled! At first, I was a little sad realizing that the magazine didn’t actually exist, and then it came to me. Maybe I’m the one to bring this magazine into the world. At first, I laughed a little at the thought. Later, I considered it more closely and considered a few reasons why it made some sense. I’m passionate about the subject. I had a BA in English and was soon to have a Master’s degree in Communication. I love magazines and read them all the time. I was a bookstore manager and then a district manager for a book wholesaler. I loved and was a part of the publishing industry for all of my adult working career (17 years at the time). In my thesis I discovered that although letter writing was changing with the times (email, social media), it was far from dead as it was being decried by so many. In fact, the internet/email/computers were actually helping the cause (letters, journals, planners) because it was creating a platform where users could find each other: groups, hashtags, blogs, social media, etc. So here we are today, at the intersection where Dream meets Reality.